It looks like China will be out for the entire week to celebrate Spring Festival, while finance, trade, and economic ministers will be busy in Switzerland starting on Wednesday. Still, you should watch for big reports coming up, such as Australia’s CPI, RBNZ’s interest rate decision, and the preliminary U.S. GDP reading. Remember when I posted about my STA strategy a couple of months back? Well, here’s something to help you out! I have already marked previous week and weekly ATR levels for you! What Moved the Comdolls Last Week? First up on my brand-new Comdoll Trading Kit is a quick recap of the events that made an impact on comdoll price action last week. After all, reviewing the fundamental factors that moved the markets is an important part of deliberate practice! 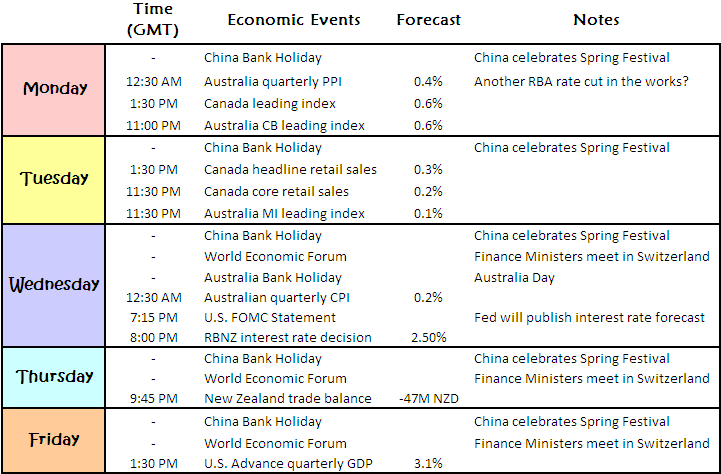 After a bit of a shaky start on Monday, comdolls joined the risk rallies on Tuesday when China printed a stronger than expected GDP for the last quarter of 2011. As it turns out, the Asian superpower grew by 8.9% during the period, a few notches better than the 8.7% consensus. Industrial production and retail sales also printed strong results, providing an extra boost for the Australian dollar. However, things turned a bit sour for the Aussie the following day when the Land Down Under showed weak jobs data. The Loonie, on the other hand, seemed to benefit from the rise in oil prices brought about by the ongoing oil embargo. Aside from that, the Loonie also found support from the bullish BOC statement, as the central bank hinted at better economic prospects for Canada. Meanwhile, the Kiwi was also able to take advantage of improved risk appetite as it ended the week stronger against the Greenback, with NZD/USD managing to keep its head above the .8000 handle. Here’s a ‘lil something extra for today! On AUD/USD’s 1-hour chart we can see that the pair broke above 1.0300 as early as Monday. If we only threw a Fib on the chart, we would’ve seen a potential retracement play at the 38.2% Fib near 1.0300. 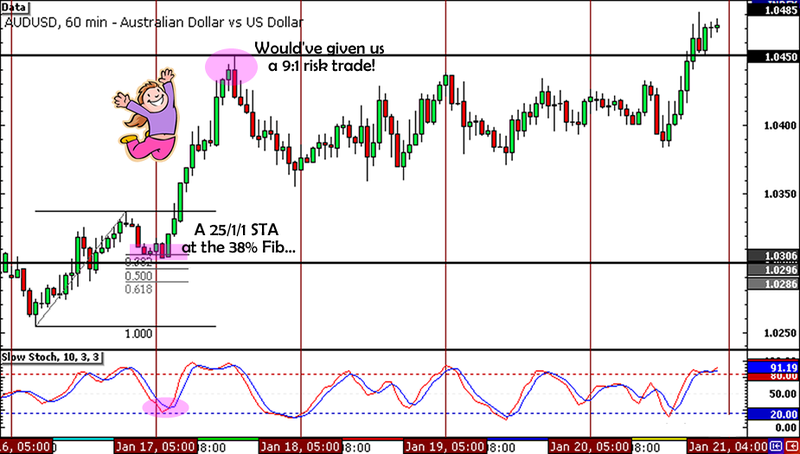 In fact, if we had used 25/1/1 STA at 1.0310, we would’ve gotten a 9:1 reward-to-risk trade! Too bad I spotted the setup late in my trade idea last week! Some of you might be wondering why I posted all of my comdoll weekly replay’s contents today instead of completing it tomorrow. Well, I recently decided that comdoll traders might need more than a review of last week’s fundamental and technical action in order to prepare for your trades. So starting tomorrow, I will post previews of upcoming comdoll events as well as important comdoll levels to look out for. Hopefully this will help newbie traders like many of my friends prepare for the week ahead. Got any questions? Call me, tweet me if you wanna reach me!